SAN DIEGO: Defence secretary Ash Carter said on Thursday the US will “sharpen our military edge” in Asia and the Pacific in order to remain a dominant power in a region feeling the effects of China’s rising military might, reports AP. 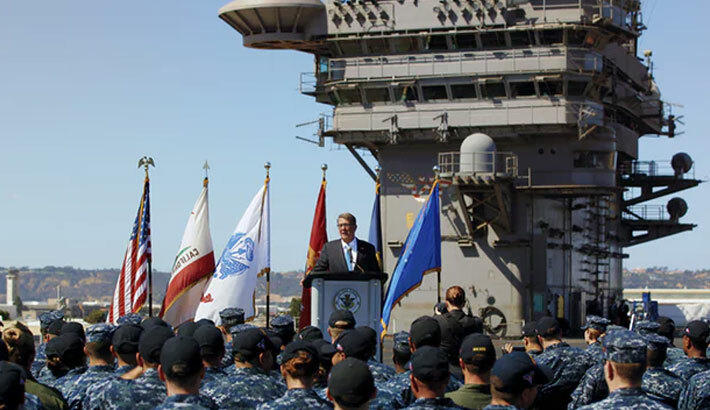 Carter made the pledge in a speech aboard the aircraft carrier USS Carl Vinson in port in San Diego. The Pentagon chief described what he called the next phase of a US pivot to Asia — a rebalancing of American security commitments after years of heavy focus on the Middle East. His speech, aimed at reassuring allies unsettled by China’s behavior in the South China Sea, came three days after he made remarks at a nuclear missile base in North Dakota about rebuilding the nuclear force. Those comments prompted a strong reaction from the Russian foreign ministry, which issued a statement saying it had interpreted Carter’s statement as a declared intention to lower the threshold for using nuclear weapons. Carter said the Pentagon will make its attack submarines more lethal and spend more to build undersea drones that can operate in shallower waters where submarines cannot. “The United States will continue to sharpen our military edge so we remain the most powerful military in the region and the security partner of choice,” he said. With a broad complaint that China is “sometimes behaving aggressively,” Carter alluded to Beijing’s building of artificial islands in disputed areas of the South China Sea. Carter’s speech was meant to set the scene for a meeting on Friday in Hawaii with his counterparts from the 10 member countries of the Association of Southeast Asian Nations, or ASEAN. The association focuses mainly on trade issues, but in recent years, with US encouragement, has sought to engage in a range of defence and military issues. The US is not a member of the organization but has sought to use it as a forum for further developing security partnerships amid regional concern about China’s military buildup. On Carter’s flight from San Diego to Hawaii later on Thursday, a senior defence official aboard the plane told reporters that Carter expects to hear concerns from some Southeast Asian ministers, including those from Singapore, Indonesia and the Philippines, about the threat they perceive from an expected return of extremists who have been fighting for the Islamic State group in Syria and Iraq.